Lebanon: It’s bold, dazzling, and arguably the best travel destination in all of the Middle East. With history dating back to the Phoenicians, Lebanon’s ancient past is among the country’s most utterly fascinating draws. From Baalbeck, one of the best examples of Middle East Roman architecture, to the Temple of Bacchus, this country is full of splendid ancient temples, looming Roman coliseums, and dramatic mosques. But this Mediterranean repose boasts much more than ancient ruins. You will find vibrant coastal hotspots, such as Jounieh, as well as world-class skiing destinations in the mountains. And, of course, Beirut is an absolute must. Rapidly gaining a reputation as the region’s party place, this unique city is often known as the “Paris of the Orient.” In Beirut, ancient temples meet the ultramodern: You will find world-class universities, an incredibly vibrant nightlife, internationally renowned museums and art galleries, and one of the freest gay scenes in the region. Visitors are well-advised to check out the National Museum of Beirut and meander through the city’s infamous souks, a kind of open air-market. And don’t forget to bring an appetite! From hummus to lobster, we can assure you that when in Lebanon you will dine like a king. Lebanon does present some travel challenges. Power cuts, political demonstrations, and unrest can interrupt travel plans, so it is important to be cognizant of potential problems and prepared. 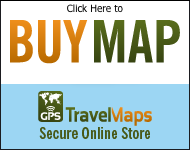 Luckily, with GPS Travel Maps, you can navigate around any obstacle thrown in your way with ease. Pick up our Lebanon map. This GPS map will give you turn by turn directions to your destination using a point of interest (POI), city point, and/or latitude and longitude, with the ability to preplan driving destinations before getting into your car.